Kabuli chana and paneer usli recipe - Here is another simple and easy paneer and kabuli chana usli recipe. 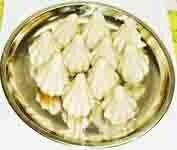 It is just a fabulous dish, either used as snack or side dish along with other main course for rotis. Cook the kabuli chana in pressure cooker till tender. Drain out excess water and set aside. Cut the paneer into small sized cubes and put them in hot water. Heat the oil in a pan and add the mustard seeds. When they splutter, add the cumin seeds, curry leaves and broken red chillies. Saute for 1 minute taking care not to burn the red chillies. Add the asafoetida, curry powder, red chilly powder, turmeric powder and saute for 10 seconds. Remove the paneer from hot water, gently squeeze and add. Add the cooked kabuli chana, salt, sugar and stir to combine. Cook covered on low flame for 4-5 minutes, stirring in between. Remove from the heat and add lemon juice and mix well. 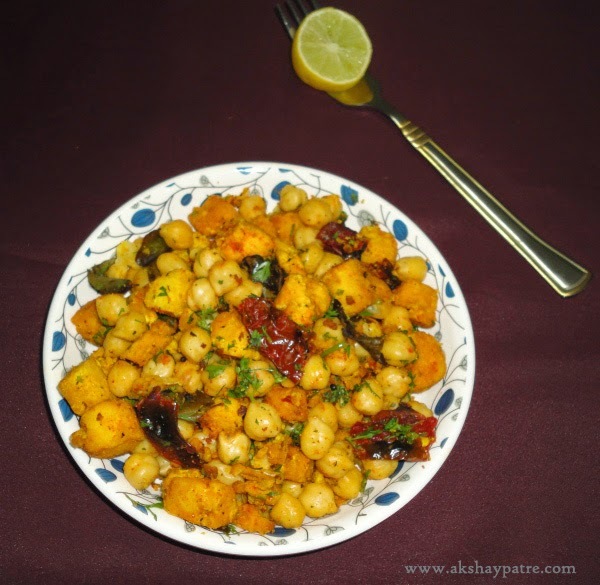 Garnish with chopped coriander leaves and serve the kabuli chana and paneer usal hot as a snack or side dish. channa and paneer a nice unique combo.. yumm..